Please print and sign and bring into the library. Reading is essential for success in school and in life. As a parent, you can have a great impact on your child's ability to read and to learn. Reading aloud to your Kindergartner for just 20 minutes a day can help your child develop a love for reading and a readiness to learn to read. Use the West Bloomfield Township Public Library to find great books to read aloud. Let your Kindergartner check out books using his or her own library card. 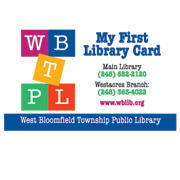 "My First Library Card," designed especially for young children, helps encourage library use and promote lifelong reading. To get this special library card for your Kindergartner, complete the application form on the back of this card and bring it to the Library. The West Bloomfield Township Public Library is partnering with parents to raise a community of readers. *Information about due dates and other circulation notices will be sent by email; please check this email address on a regular basis.